Just A Scrappin' February 14th Valentines Day! Anything goes, using anything but RED. I dug into my stash and found this gold foil heart, then went looking for something else for Valentines Day here is what I ended up with. I cut using Art Philosophy cartridge <Branch2> layer at 4" in brown/greenish cardstock from my stash, <heart1> at 1/4" & 1/2" in different colors of green from stash. 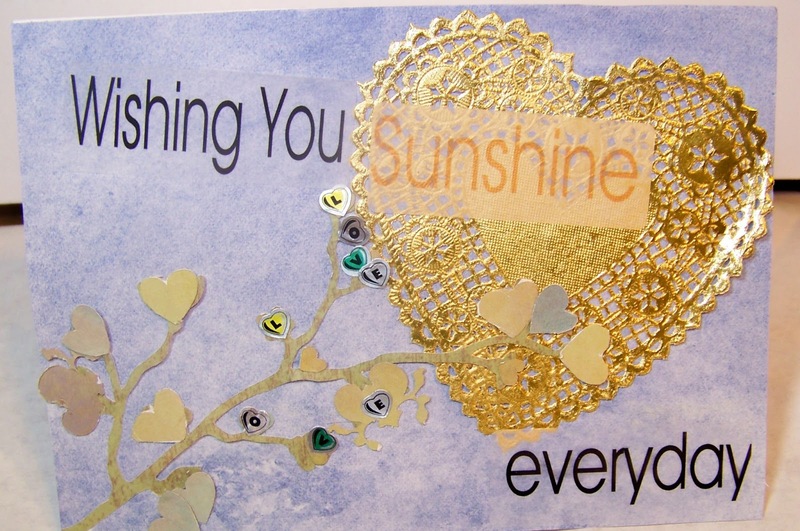 Using 3M adhesive glued the Branch from the left edge across the card over the gold foil heart. Then I took the 1/4" hearts and used them as buds, and the 1/2" hearts as leaves. Next I added the stickers to spell LOVE across some of the buds. Last added sentiment printed by computer. Come join us at Just A Scrappin' ! What a gorgeous card! I love the colors you went with and love the sentiment. Wow! The gold accents are just gorgeous! 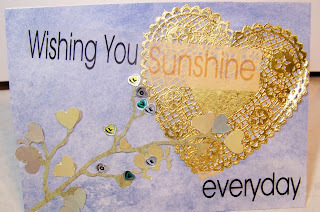 I like how you changed the color in "sunshine"--very clever!